Greg's Steakhouse is the first steakhouse in Bermuda, and the warm and welcoming ambience is more like having dinner at Greg's house than at a restaurant. Owner Greg L. Wilson and Owner/Chef Colin Lloyd have a small goldmine in their award-winning restaurant Greg's Steakhouse in Hamilton, Bermuda. 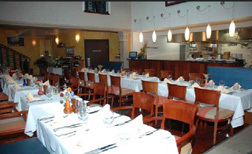 Located on the corner of Church Street on "Parliament Row" the restaurant attracts politicians as well as celebrities. Edward F. Nesta and I had dinner at the restaurant in October 2007, and found the atmosphere to be warm and inviting with jazz music playing, and an interesting collection of artwork by local artists from their personal collections displayed on the yellow and white walls of the restaurant. Architectural details include an open kitchen, where guests can watch Chef Colin Lloyd and his team of chefs in action, a bar in the front of the restaurant, carved columns on either side of the dining room, and a wrought iron staircase at the back of the restaurant that leads to the second floor, where another hidden gem awaits, G Sushi, where guests can enjoy drinks and sushi. Seating is at blue upholstered intimate booths as well as at tables with red and gold printed upholstered wood chairs. Tables are double dressed with blue linens topped with white linens and orange napkins, and adorned with miniature Hurricane lamps. Attention to detail include well-balanced steak knives that fit your hand, there are no wimpy knives here. Befitting the name of the restaurant, Edward began with an appetizer of Beef Short Ribs that were Dry rubbed, with their secret Gosling's Black Rum sauce, and sweet slaw. The ribs were so tender that you could cut them with a butter knife and fell easily off the bone, and the sauce was a delicious complement to the meat. I went off on a different culinary vein and began with Lobster Cakes, which were two lobster cakes made with lump lobster meat stacked on top of each other, with sweet Bermuda Gold cream, crowned with crunchy Bermuda onions, and garnished with a cherry tomato half, with a tasty drizzle of sauce on the plate. Continuing in the steakhouse manner, Edward selected owner Greg L. Wilson's favorite steak, the 10 ounce New York Strip Steak, Certified Angus Beef® sirloin char grilled finished with maitre'd hotel butter accompanied with twice-baked potato and fresh asparagus with Hollandaise sauce for his main course. For a steak lover, this was about as good as it gets, with the steak arriving at the table sizzling with perfect grill marks. Presented with the side dishes of twice-baked potato and the asparagus with Hollandaise sauce, and paired with a glass of Australian Shiraz, this course really rocked. For my main course I selected the Norwegian Salmon that was Cajun seasoned with a rich shrimp bisque sauce, garlic mashed potatoes, and butter sautéed shrimp, paired with a glass of Sauvignon Blanc. This course was presented as an ample filet of salmon tilted against a hearty portion of mashed potatoes with skins, topped with the shrimp and sauce with the sautéed spinach cascading down the side of the mashed potatoes with skins. Two things are certain at Greg's Steakhouse, namely that the food is well prepared, and that with the size of the portions, no one will leave hungry. Read Chefs' Recipes where Chef Colin Lloyd shares his recipe for Peppered Rib Eye (Cow Boy) Steak with Classical Sauce au Poivre. 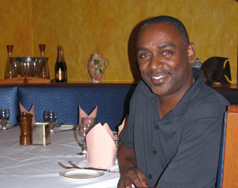 Please read other articles on Bermuda in the Destinations, Hotels and Resorts, Chefs' Recipes, and Adventures sections. For information on Bermuda, please visit the website www.Bermuda.com or call them at: 1-800-223-6106 (in North America). © November 2007. Luxury Experience. www.LuxuryExperience.com All rights reserved.